Companion It's all here: Africa, the Arctic, atrocious food. Headhunters and evil spirits, liars and thieves. From Tbilisi to Tibet to the Trans-Siberian, a crisp, compelling survey of what it's like in the real world. 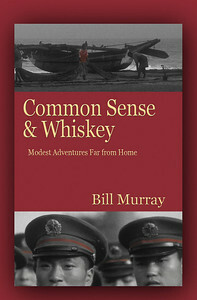 Perceptive travel tales, masterfully told. Fifteen stories from Bhutan, Borneo, Burma, Greenland, Guangxi Province, China, Lake Baikal, Madagascar, Malawi, Papua New Guinea, Paraguay, Patagonia, The Southern Caucasus, The Trans-Siberian Railway, Sri Lanka and Tibet. of your own to share. That is what Bill Murray does so well. Rich and inspiring. Filed with surprises and great adventures." us beautifully with unassuming prose and evocative images. Brings home the exoticism of foreign travel. A fantastic collection. Back to EarthPhotos.com or Common Sense and Whiskey blog.